Getting a fitting, creepy locale for a horror game is pretty simple, right? but it often leads to a raft of uninspired settings. An asylum? Yawn, we get it. An old spooky house? The concept is probably older than the house itself. Is this a graveyard? In the woods? What originality! 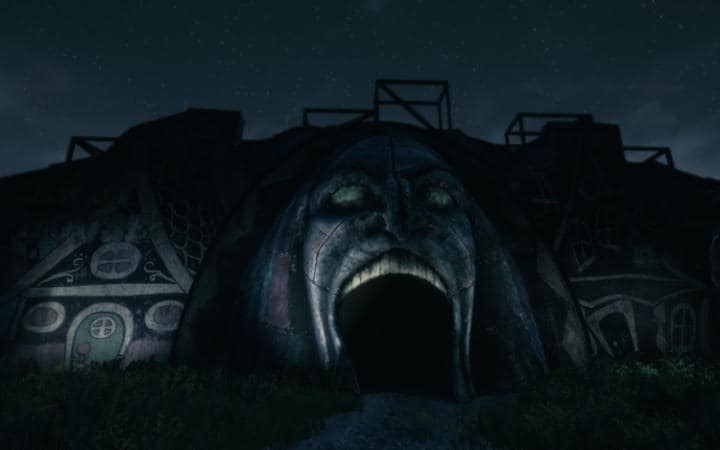 There are plenty of suitably atmospheric settings you could use for a horror game that don’t get used near enough, and Funcom’s The Park explores one such place: an abandoned amusement park with a dark history. If only the setting wasn’t the pretty much the best thing about The Park by a considerable distance. The Park is an offshoot of Funcom’s The Secret World, an MMO which also uses the titular park within its lore. The Park is set way before the events of that game, however, though fans will undoubtedly see the connections between the two. You play from a first-person perspective as Lorraine Maillard, a single mother who has just taken her young son Callum to Atlantic Island Park for the day. He says he lost his teddy bear so Lorraine goes to the information desk to find it. Callum chooses this time to run off into the soon-to-be closing park, so Lorraine gives chase. Halfway up the escalator, things take a strange turn and Lorraine emerges at the top of the escalator to see the park in a state of abandonment and disrepair. Something very odd is happening here, but why? The next hour or so is spent piecing together the sordid, dark history of Atlantic Island Park, whilst pursuing Callum. You’ll not be doing much more than drinking in the brooding atmosphere by walking around and interacting with various objects of interest within the park. Don’t go expecting puzzles or combat here; this is very much a storytelling experience. The game does a fine job of that to begin with, building a sense of dread beautifully. There’s a very strong Stephen King vibe to The Park, in both the way it presents itself and in how the story is told and evolves, for better and for worse. There’s that very King-esque dreamlike quality to Lorraine’s story, leaving you initially unsure of how real the events that occur are. This is most apparent in the trippy sequences where Lorraine goes on the rides, each is ahighlight in terms of creating a brooding horror feel. A good amount of The Park’s horror is quite subtle, not relying on cheap scares (though there are plenty later, all flat and about as terrifying a a puppy in bubble wrap), but prodding away at you, reminding you consistently that this place is wrong with smaller instances of strange occurrences offsetting the dreary abandonment of the park. All this promise regrettably begins to crumble as you reach the game’s finale, a finale that apes P.T. a little too enthusiastically, yet delivers little of the impact. Two major problems cause this slide into the pit of disappointment. The first is the story has already pretty much clued you into what’s going on by the time you reach this end section, and like a fair few of Stephen King’s weaker stories, the finale spends far too much time hammering the already obvious point home whilst dissolving all that creepy atmosphere into a mush of terrible jump scares. I get that the developer wanted to stretch the length of The Park a little more, but that honestly could have been done better by giving you more of the park itself to explore. Or indeed had more to do in what is already there. That brings us to the second problem, namely the game’s length. Now a good game is good, regardless of length—see Journey or Sonic the Hedgehog for example. I explored the resort in some depth on my first playthrough and including a ten minute pause to make a coffee, I’d finished the game in under ninety minutes, and twenty of those were the bemusing finale. At just shy of ten English pounds, it is incredibly difficult to recommend a game this short, and lacking in replay value. I played again once more to mop up a couple of Trophies and see if I missed anything; that took just fifty minutes, and it was nowhere near as enjoyable the second time round. Just over two hours of play, around an hour of which is actually quite good, and there was nothing else to see or do. The fumbled ending (which, in fairness, does have some interesting aspects to it, if it weren’t for the poor delivery) doesn’t help matters, leaving you more frustrated at the pacing than anything else. The first hour is a build up for a game that’s a good two hours longer than The Park currently is, and it only serves to make the last part seem like an afterthought—or like something was cut out in the middle. Certainly Lorraine’s narration takes a bit of a swift turn. It’s a curious case, because there’s some fascinating and experimental horror in The Park. The setting, as mentioned, is suitably grim and haunting even when nothing is going on, and the earlier, more subtle traces of horror are such a refreshing change from the full-on nature of most modern scare fests. That finale destroys it though, absolutely murders the decent pacing that existed for the majority of the game. It has none of the subtlety required to pull of an artful horror masterpiece when it truly matters, and that, in part, drags a good, solid horror game down into the depths of disappointing and dull. Consistency in the person telling the story would also have helped. Lorraine’s narration swings between a pitch-perfect dreamy lilt and a horribly-delivered squawk of panic so wildly that it’s almost like the performance is an awkward homage an actual rollercoaster. All this aside, I would like to see more of this Secret World offshoot. It could easily be expanded into a lengthier, more complex, modern take on games like Silent Hill if Funcom would be so inclined. There is enough here to suggest that given the time, money and effort, a sequel to The Park could fully, and successfully, find its own place in video game horror. As it is, you can tell that The Park has its origins in the experimental; an idea brought to life with a lack of forethought hobbling its message. The Park has some good ideas for a new horror game series, but the execution of them derails a potentially enjoyable rollercoaster of chills and thrills. There will come a day where The Park is available on PS4 for peanuts, and that day is when I’d fully recommend trying its fresh, but flawed, brand of horror out. Until then, the price of admission is too high for the brevity of the ride. Especially for one that has more than a few nuts and bolts missing from it.